Fennel is a friend of mine. I’ve grown it every year I’ve been a gardener, and, much to my amazement when I first moved West, the plant grows wild all over California. It’s a weed. A delicious, anise-flavored weed. High summer is a busy time if you are into fennel because the plant is setting seeds and is in full flower. Lots of people collect the dried seeds in late summer, but I prefer the fresh, green seeds, which are juicy and taste like anise candy. They are a powerful highlight in any dish, and unlike the dried seeds, they won’t get stuck in your teeth. As for the flowers, flowers mean pollen. 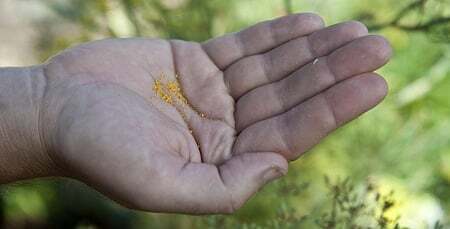 Fennel pollen. 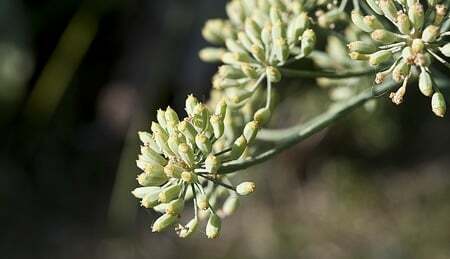 It’s a trendy ingredient now, and you can see it all over the place in high-end restaurants, especially Italian ones; fennel pollen is used a lot in Tuscany. The pollen is often frightfully expensive. The plus side of this method is that you don’t have too much work to do. The down side is that you get dried pollen, which is wonderful stuff… but not nearly as wonderful as fresh pollen. 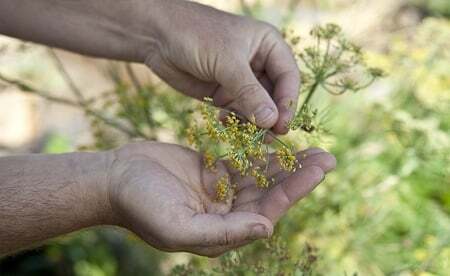 There is a reason why fennel pollen isn’t cheap. It is easy to gather, but because each flower yields so little pollen, it can take an hour of gathering to collect an ounce. You’ll also get all sorts of creepy crawlies in the pollen, which need to be evicted before you can store it. A few seconds in the microwave kills anything too small to see. How do you use the pollen? All sorts of ways, really. I’ve made an Italian olive oil cake with fennel pollen, used the pollen in soups and sauces, dusted it on meat and fish, and put it in a Greek fennel cookie I call Bacchus Biscuits. 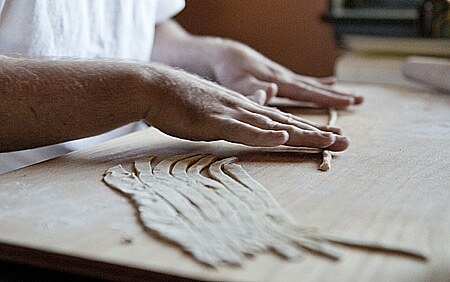 After a recent pollen foraging trip — “trip” makes it sound more grandiose than it was, as wild fennel grows everywhere around here — I came home with enough to make a fennel pollen pasta dough. 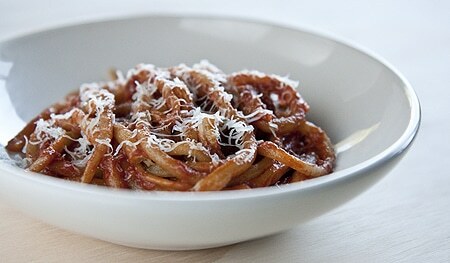 The sauce is sweet and tangy and strong, but not so strong as to mask the fennel pollen’s flavor from the pasta itself. I made this again for a couple of friends last night and they gobbled it up without a word — always a good sign when the food stops the conversation. 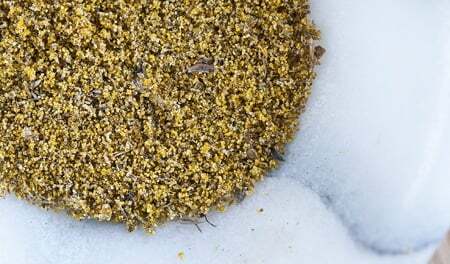 Summer’s not only the time to collect fennel pollen, it’s also the time all us hunters clear our freezers of last year’s game. Dove season is just a few weeks away, and cottontail rabbits are already in season, so we ned to plow through our remaining wild game before September. Fennel matches really well with white meats like chicken, so I hauled out some pheasant breasts to make a cool summer salad. Pheasant breasts can dry out in a heartbeat, so I have a special way to cook them: I get some pheasant or chicken stock just to a strong simmer, drop the pheasant breasts in, cover the pot and turn off the heat. It is a super gentle way to cook the pheasant, and it’s foolproof — if you leave the meat in too long, the stock’s temperature is going down anyway, so it’s very forgiving. After the meat cools, you shred it by hand and add to it chopped fennel bulb, a little hot chile, mint — and some fennel pollen and green fennel seeds. It’s a wonderful salad, and it is definitely a fennel explosion. If you don’t like anise flavor, skip this one. 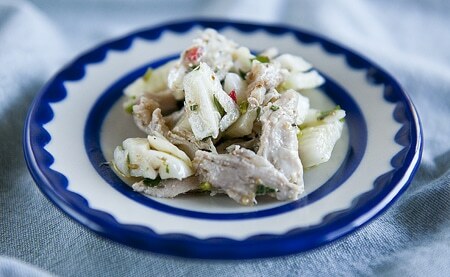 How to you use fennel? I am always looking out for new ways to eat it. Great info.! I nibble on the green tips on hikes. …good to know there are an edible fennel variety!